Back in January I said I would talk about all sorts of ways that a gardener gets through winter. Well, here we are at the beginning of March and while it’s just beginning to approach “normal” in terms of temperatures where I live (normal being around 40 degrees Fahrenheit or so), it will be a long time before the piles of snow and ice melt, and an even longer time before we can get out to assess the damage that the snow, cold and ice have done to our gardens (and homes). But one of the things that I did want to touch on before I need to get into the topical things that gardeners should be doing as we all start to get into prime gardening time is to think about how you are going to record your gardening successes (and the things that you vow to yourself that you will never do again so long as you live!) You need to have some sort of organized system of doing this that don’t consist of merely throwing plant labels in a file or envelope or shoe box (not that I would know about this of course). I’m actually a prime offender and have 20 or more years of files of plant labels. But that is not all I do. 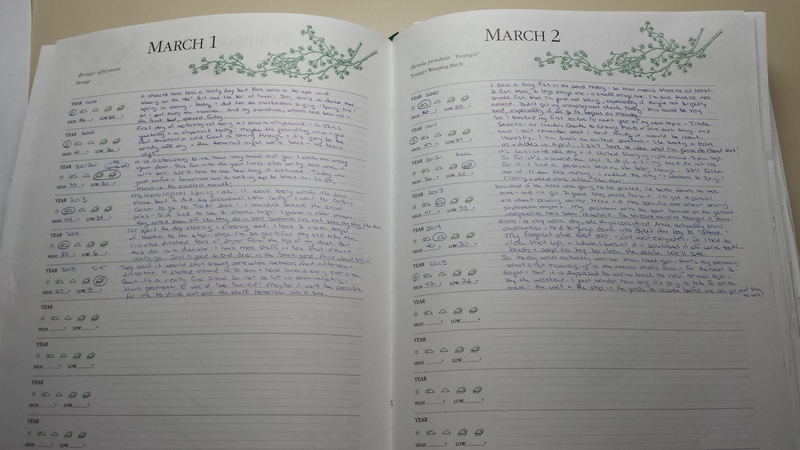 I got terribly organized 16 years ago and found a system that I use without fail every single day of the year, 365 days, and have for over 15 years. I use the Lee Valley A Gardener’s Journal. Mine looks like this, which is what makes it perfect for using every single day of the year. As you can see, there’s a brief spot for notes, which I pretty much fill every day. There’s also a spot to circle the weather of the day (very valuable to spot trends) and to record the high and low temperatures of the day (ditto). Since we gardeners are such optimists, recording the weather is a huge help because it helps to see that, oh yes, it was exactly this cold this time last year and three years ago as well. Or, as I was trading stories with a fellow gardener over the weekend, every year I lament “Oh I’ve never started my tomatoes this late!” And then sure enough, I flip a page or two in my garden journal and see that I started them even later the prior year so it really is going to work out after all! And because there’s no room to write a novel so you’re never tempted to skip it because you’re just too exhausted. The front of the book has pages for landscape plans, planting records, and plant purchases (were you that organized.) I just staple my receipts to the pages for the date I buy things. Needless to say, the book gets pretty “fat” by the time the 10 years are up. This is my second one–I’ve already filled up a 10 year one that I began in the year 2000. But, then again, I still like paper. I still carry a paper calendar. Not everyone wants to do that. But we all carry those fabulous little computers in a pocket too (otherwise known as “smart phones”). On Monday, I’ll talk about some of the 21st century ways we can keep garden journals. Good luck to you! I’ve read your trials with the house. It sounds as if the next garden may be a “garden in waiting” a bit!